Star Plus' Yeh Hai Mohabbatein is one of the longest running shows of small screen. This one of its kind show started off with a concept based on the novel The Custody and has been winning hearts since then. 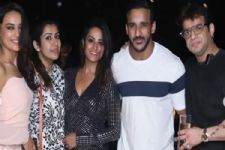 With many twists and turns, the stellar cast including Karan Patel, Divyanka Tripathi, Aditi Bhatia, Anita Hassanandani and others is the favourite among the audience. Karan and Aditi's father-daughter chemistry has been loved by all. Well, while rumours are rife that Yeh Hai Mohabbatein is all set to go off air, the father-daughter duo is all set to come on screen in another show. And guess which one we are talking about? Well, the duo will be seen in Colors TV's Khatra Khatra Khatra. Along with Haarsh Limbachiyaa, Bharti Singh, Karan and Aditi will be seen undertaking challenges and cracking jokes that will keep you rolling on the floor. Aditi is often seen sharing pictures and videos stuck in traffic and the show will also involve a segment on the incident. Love you Aditi Bhatia. She is so cute. Want to see more Ruhi scenes in YHM. Keep rocking Karan Patel and Aditi Bhatia.